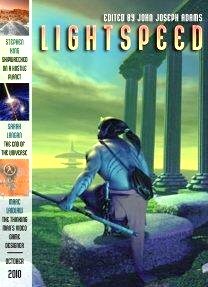 Lightspeed’s October issue opens with a somber reflection on human hubris. In "Hindsight" by Sarah Langan, a gravitational anomaly has appeared around the orbit of Mars and begun to spread. According to scientists from the corporation running America's defense and scientific establishments, this anomaly – called Black Betty – is an eruption of another universe into ours, bringing with it different physical laws and the imminent destruction of Earth and, possibly, the rest of the universe. The Second Coming, built from unique materials designed to resist the anomaly's influence, is buried inside the skin of the Earth, there to wait for the encroaching boundary layer of the anomaly. Sarah Vaughan, her husband and two children, are among the two-thousand-odd passengers of the Second Coming. As the anomaly boundary layer approaches, things are not going well. The ship should survive. The humans inside, however, will not. Then a breakthrough in human-computer upload is made, making it possible for some of the people to live on as minds in the machine. Provided they can live with the mad commander of the venture inside the machine mind. Langan makes the most of her premise here. Because of the anomaly's presence, the Earth's magnetic field flips. I loved how Langan used the extinction of birds to illustrate the severity of this problem. This seemingly insignificant detail made a great stand-in for the human condition: forces unknown bearing down and wiping out the powerless avians. As a parent myself, I quite understood how the characters of Vaughan and her husband would do anything to ensure the survival of their children. Langan quickly glosses over the horrors the Vaughan commit to ensure their family's survival, quietly showing the lengths to which people will go to survive. While the twist at the end was a bit overused, and a bit ineffective, I enjoyed the dark journey on which Langan took her characters. Her effective prose made me feel like I'd need to wash out my brain after I was done reading, just to get some of these ideas and scenes out of my head. Effective, indeed. John R. Fultz's story of moral calculus, survival and cannibalism in space, "The Taste of Starlight" opens with our. . . protagonist, Dr. Pelops gasping back to life stuck inside a malfunctioning CryoPod onboard the Goya, a spaceship on a rescue mission to abate a famine on a distant colony under a red-dwarf star. And therein lies my major problem with this story. The Dantus colony was founded under a red sun and, oddly enough, now their crops won't grow because they're not getting enough of the right kind of light. You'd think this would have occurred to someone in charge, but, no, it didn't. Instead, the Powers That Be wait until a famine strikes and then send out a rescue ship with ultraviolet conversion domes, designed to refract the sunlight correctly so that the plants will grow. Travel duration from Earth to Dantus: seven and one-half years, all while a famine is raging, and there's nothing the colonists can do but wait for the UV conversion domes. Seven and one-half years with no food growing. And there's thought to be an actual reason to send out a ship to attempt rescue? Uh-huh. Right. Six years into the voyage, the Goya undergoes a malfunction that causes the power to cut off, leading to damage to two CryoPods, that of Pelops and one Tanaka. Pelops made it out of the CryoPod alive. Tanaka wasn't so lucky. Pelops manages to fix the malfunction, but finds he still has sixteen more months to journey to the colony. To make matters worse, with Tanaka gone, he is the only one left who can get the UV conversion domes up and running. Those poor colonists who have gone more than seven years without food are counting on him. He must survive to complete the mission. Then Pelops discovers there is only enough food stored away to last him three months and he can't repair the CryoPod and go back to sleep. These issues really kicked me out of the story. No one thought about spares? No one considered the possibility of disaster? Both of these developments, along with the mysteriously surviving colonists who can last seven years without food, are a really big plot hammer. These things have to have happened if the story is going to work like the author intended. And, yes, I had a problem with that. Provided you can jettison all of these plot hammers and just accept the story as is, you're in for a real treat. Fultz writes a genuinely creepy story, echoing the movie Alive and, perhaps Stephen King's "Survivor Type." Pelops does the moral calculus and decides the lives of the thousands of colonists are worth more than the lives of the other twelve people still sleeping in their CryoPods. Through a process of trial and error, Pelops learns how to make the "meat" last as long as possible. His behavior is logical, practical and horribly appalling all at the same time. Of course, the isolation, combined with the knowledge of just where his delicious chop really comes from, work to drive out the saner portions of Pelops' mind. I was completely engrossed as I watched Pelops dive head-first down the slippery slope into insanity, all the while claiming he was acting logically and to fulfill the needs of the many. There's a final twist near the end that brings out one of the plot hammers and takes a swing at the reader's head, but it's forgivable. Overall, I'd say "A Taste of Starlight" is a flawed, but eminently readable story and well worth your time.